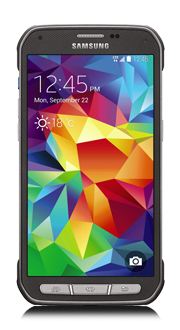 bell Galaxy S5 Active Rogers samsung telus Samsung's Galaxy S5 Active is tough enough for Canada! Samsung's Galaxy S5 Active is tough enough for Canada! So the Samsung Galaxy S5 came out and was quite the showcase to some as it came with water resistance out of the box. To many who have not seen the Sony line up ... this was awesome! So, when Samsung announces an S5 'active'... what more can they bring to it than water resistance? In respects the device is basically the S5, but adds in that 'active' component. Well, knowing most Canadian environments the S5 Active is not only the IP67 rating (1m for 30m) it passes through the military standards of MIL-STA-810G. Now that's a mouthful. But what does that mean? Military is tough right? This standardized testing sets the phone against a barrage of environmental conditions (18 to be exact) including temperature, sand, dust, pressure, etc..
That's pretty intense. But given our propensity for extreme climates (in my own day we go from about 5C in the morning, to 25C in the afternoon and then a gamut of cold, windy, rainy to humid or dry). It's good to know that this device will withstand it all; just like us! Is it the true Canadian device? It's currently available at Bell, Rogers and Telus ($280 or $700 outright). That is kind of an annoyance to me, that it's the same base price as the S5, but if you want it on contract it's more expensive than the regular S5. Again, the carriers do a terrible job of being clear on their subsidy.